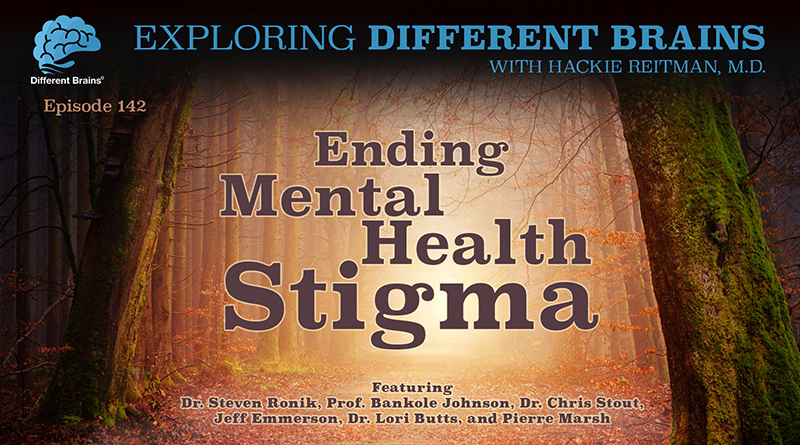 In this episode, we hear from 6 neurodiversity leaders as they discuss the challenges of overcoming the stigma related to our brains. HACKIE REITMAN: Hi, I’m Dr. Hackie Reitman. Welcome to another episode of Exploring Different Brains. 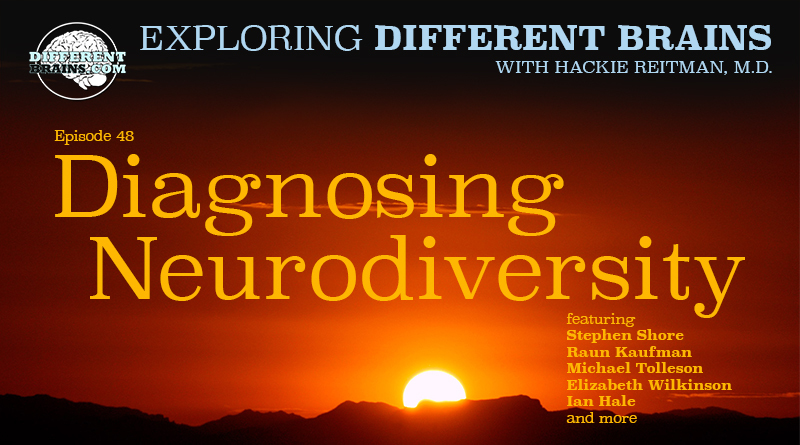 Today we have a special episode that is going to be highlighting the neurodiversity leaders we’ve interviewed over the past several months who are addressing the issue of stigma. Stigma is something we battle here every day at Different Brains, and these leaders are about to tell you why. Our first guest is Jeff Emmerson, a mental health advocate, public speaker, author, and massive social media icon in the mental health arena. HR: Well you went through a long haul in order for you to get your diagnosis. Tell us about your diagnosis and the path to getting your diagnosis. JEFF EMMERSON: Yeah it’s interesting and was a major driving force in why I wrote the book at least the first book. I have to remember it all obviously. But going back it all really came down to having a few you know checklist type tests from the DSM and others to rule out things like bipolar disorders one and two’s, hypomania, anxiety disorders, and several others. Acute and chronic depression and other things. And what we, the way it culminated, I guess to make a long story short, is that through all those tests and things, basically the, I call it the label sometimes, but the diagnosis of ADHD was the one we went with. And I know that kind of sounds perhaps a bit shady, if you will. I remembered to this day when it was almost suggested to me that well maybe it’s ADHD Let’s go with that. Let’s see how medication works for it. And certainly you know by well meaning people and you know all that stuff. You know people did their best to try and rule things out. From childhood trauma to other things, diet, nutrition, exercise, all that stuff. Trying to look at my overall life from a holistic perspective. And I didn’t know any better myself at the time, so I thought well okay I’ll go along with this ADHD diagnosis, and it seemed at first Hackie to be an overwhelming sigh of relief. Because at least I knew because I’ve heard others say, It’s like a weight was lifted. There was some explanation into why you know a lot of my past happened like it did. Not as a crutch obviously but anything like that. As somebody who’s very driven but couldn’t seem to convert that to success in any given area. So yeah long story short, we went with that diagnosis. I remember researching some medications at the time trying to figure out what might be, you know maybe some more modern, cleaner I remember it was a term we used, medications that again I, not being the Doctor myself I’m no expert there but Adderall vs. Ritalin sorta thing and some others we were looking at. Essentially all I did was go on Adderall for about 6-7 weeks roughly. And that was it. And I noticed absolutely zero change, I think I was on maybe two dosages at the time. So again I noticed somewhat crude but looking back, you know and it was like a shot in the dark, something while on that medication, speaking with my wife at the time, I realized I’m not really noticing much. Is this really supposed to help solve things. Obviously I was completely green, so from that, it started the whole journey Hackie into questioning my diagnosis and digging deeper. HR: Next up we have Pierre Marsh, who is a civil and commercial mediator writing a book about dyslexia, and a dedicated advocate for neurodivergence and neurodiversity. I’m of the opinion, which I have taken some criticism for that labels are a lousy way to describe a human being. Some of the well intentioned leaders and people say “Well, how are you going to give them the resources they need? What are you going to do?” So, I find sometimes that advocates like you, organizations like differentbrains.org, we’re trying to get rid of the stigma so that everybody can feel comfortable saying, “Hey, I’m dyslexic but I’m going to do the job,” or “I have Asperger’s,” or you know, you name it, ADHD, the list goes on and on. But finding that ability to come out of the closet, so to speak, and say “You know, I want everyone to know I’m bipolar and I have to be on my meds and if I get off my meds, make sure you make sure I take them.” But right now, it’s like everybody’s gotta look the other way and there’s a lot of stigma involved. Tell me about stigma and labels from your perspective. PIERRE MARSH: Well, it’s very important and I think you hit the nail on the head. The question is functionality. How good are we doing our jobs? That to me is the most fundamental point. The second point is, it’s a question of intelligence. Right, and one of the things about neurodivergence is it is intelligence in its own right and I believe that neurodivergent people for a long time have to translate their intelligence to a neurotypical way of doing things. So the burden is absolutely immense but the intelligence grows because of that process. One of the things I think which neurodivergence has to develop into is that there was a specific way of measuring neurodivergent intelligence for neurodivergence intelligence sake. And that was a more holistic way of actually a fair amount of how people actually do things. There’s no point at the age of three, teaching a neurodivergent sequential thinking development, when all the time, their ability to create and learn and understand the world is from a holistic perspective. And so what happens is that child fails, fails, fails, fails, fails, gets the labels, gets the remedial training and then gets the low self esteem and all the time, it becomes because it’s with professionals, it becomes not a difference, it becomes articulated as a pathology. And it’s from that discourse that there was absolutely no challenge to it. And that’s why it’s so important for neurodivergent people. It’s the start from what you say. It’s not a question of looking from a issue of difference and deficit, it’s a process of identifying that there are different brains that process information differently and what we gotta do as humanity is capitalize on the whole sum of human intelligence in order so we can benefit from it because I believe we are in some what of a crisis mode where we’ve gotten so used to doing things from standard operational procedures and historically those who had quite a good working memory to remember the standard operational procedures became the bosses and the leaders , but it’s all taken us to one place, which is not giving us choice. Choice of thought, choice of creativity, and I think it’s the neurodivergent’s brain, which is the key, here to give humanity options which it hasn’t got at the moment. So it’s very important. HR: Now, we have the brilliant Dr. Chris Stout, a clinical psychologist, philanthropist, author, and podcast host. On the site for the Center for Global Initiatives I just want to read this. This caught my eye because the last guy I heard talk like this was a way back. I took a two-week course in Washington DC in orthopedic pathology when I was still in medical school, by a guy named Lint Johnson who was an iconoclast. And he was head of the Armed Forces Institute of Pathology. And he saw the whole prism of the world like this. I’m quoting from on the site for the center a quote, quote, “Health is perhaps the most common denominator in a region’s potential for success as it is so intertwined with economic sustainability, eradicating poverty, preventing war, mitigating violence, and fostering social prosperity.” Can you expound upon that in terms of acceptance of mental health and everything we’re talking about here? CHRIS STOUT: There is a fellow Jordan Kaslow, who is an ophthalmologist and he was really sort of the inspiration of that perspective on my part. And one of the things that he talked about, was looking at this–this is sort of really again being holistic in a different way. We talked about just now being holistic and looking at a person as a system but when you look at cultures and you look at regions and you look at places in the world that are hotspots, their systems as well too. And oftentimes the socially disenfranchised, the marginalized, the abused, the stigmatized, are those that have mental health kinds of issues. Often times there’s very little empathy and this isn’t just developing places, this is here in North America. You know unfortunately it’s a global issue. Some places are more accepting and more open than others, some people are more accepting and open than others. But I had worked at the United Nations 1998-1999 and one of the things that I worked on was the aspect of looking at mental health and substance abuse visa vie sustainable development. And sort of the argument or the thesis that I had in that which relates back to the quote, that you very generously used, was that if without mental health there is no health so to speak. That issues of you can be the needing this kind of assistance regardless of whatever kind of circumstance it’s going to be hard to be a good parent, it’s going to be hard to be a good worker, it’s going to be hard to be a good contributor to your community, or to your tribe, or whatever. And it makes it really ironically I think a fundamental aspect of being successful in every other aspect of one’s life, even if you’re you know biologically so to speak or physically fit or healthy. If you are suffering with debilitating chronic clinical depression, you’re not going to be able to go work, you’re not going to be able to support a family things like that. So that’s the kind of aspect of you know what that point was trying to get to. HR: Next, let’s hear from one of our board members at Different Brains, Dr. Lori Butts, the president and director of the Clinical and Forensic Institute, and past president of the Florida Psychological Association. What would you say the biggest roadblock to getting rid of the stigma is? LORI BUTTS: I think it’s just the society belief. I think that it’s scary. It’s a lack of education about kind of the fear about mental illness. Even people with mental illness don’t want to be perceived as having mental illness because it’s embarrassing. They get problems, discrimination, problems moving up in jobs, problems getting jobs, I think there’s a lot of roadblocks. It’s difficult for people to talk about and to accept that mental health and medical health are the same. We need to be healthy, both in our minds and in our bodies. And we’ll have longer lives if we take care of both of our brains and our bodies. HR: Next we have Dr. Steven Ronik. He is the CEO of Henderson Behavioral Health, one of the oldest, largest and most successful providers of recovery services for persons with co-occurring disorders in Florida. What is the biggest single thing about what you do that would surprise our viewers? STEVEN RONIK: I think what one of the biggest surprises would be for the general community is its misunderstood around the science that underlies mental health treatment. Sometimes there’s stigma, not just about people who have mental health conditions, but even a stigma toward the profession in general. Mental health professionals are very regulated. More regulated and monitored and audited almost than any other division in healthcare, which, if you think about it, it probably has something to do with folks not believing in it enough. So a lot of people don’t understand that mental health conditions are brain diseases; they’re treatable, treatment works really well, mood disorders, major depression, for example, when people get that treated the right way, it gets better about 80-85% of the time. People who are treated for heart conditions, it’s about 50% recovery rate. So mental health treatment is super effective, and I think that’s one of the things that, unfortunately, people don’t understand well enough. HR: For our final clip, we have the great Dr. Bankole Johnson, neuroscientist and the world’s foremost expert on addiction. He was featured in the HBO documentary “Addiction” and is head of the Brain Science Research Consortium Unit at the University of Maryland School of Medicine. Why is it… and I’ll quote here Steve Ronik – why is it when you go to a cardiologist or an oncologist there is no stigma but if you go to a mental health professional there is a stigma attached and we get better results. We get better results and what you’re doing there, it sounds like it may help get rid of the whole stigma to all of this? BANKOLE JOHNSON: I couldn’t agree with you more and I think it dates back to a few hundred years where people tried to separate the mind from the body as if it were two components of a system that never really talked about another and at least my angle is going to be some higher order type of cognitive thinking and the body was meant to be basically the mechanics and they were not connected so if you’re going to see someone if you have mental health issue people believe that it must be due to this nebulas concept of a mind and that its some how your responsibility or at least partially your responsibility and it has nothing to do with your body. Well we know now that this is completely incorrect. The brain is the most complex organ in the universe, it has connections with you heart, it has connections with basically everything else and to give your friend the heart analogy we now know that individuals who have heart disease often also have mental manifestations of that heart disease and brain stress or distress in the brain is also associated with cardiac arrest and cardiovascular disease. It’s one system. I think some people like to make it simple, but as my professor used to say it can only be as simple as it really is. 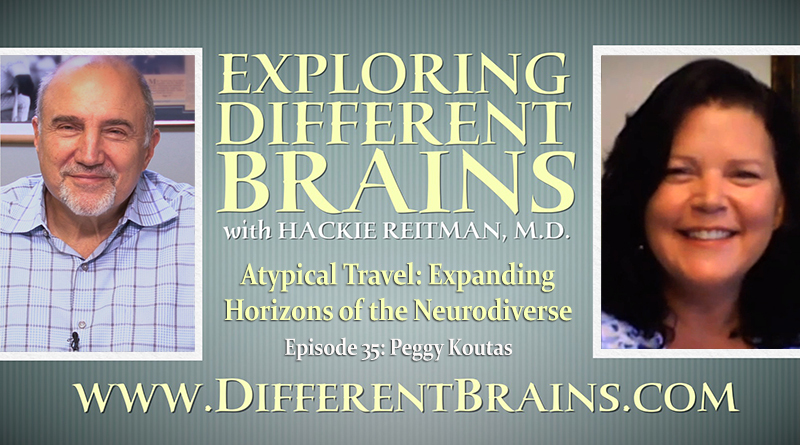 In this special episode of Exploring Different Brains, Hackie Reitman, M.D. presents 7 previous guests as they tell the story of how they were first diagnosed with autism. In this episode, Hackie Reitman, M.D. 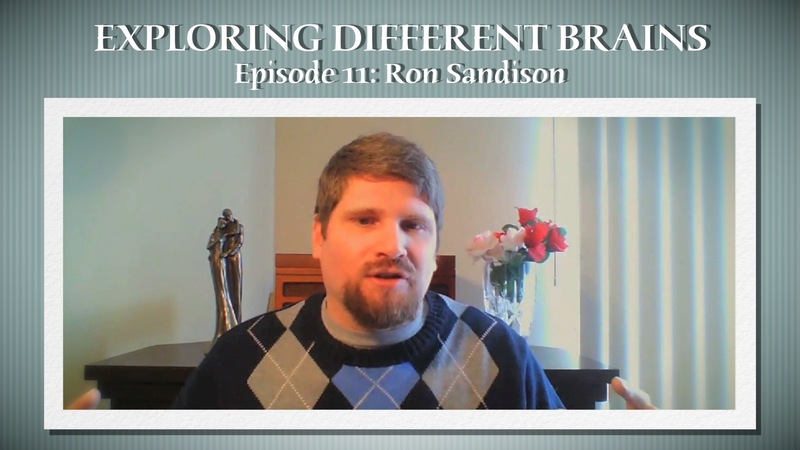 interviews Ron Sandison, an author and preacher with autism and savant memory abilities. Ron discusses the importance of parental involvement for the neurodiverse, the benefits of embracing hyper-interests, and his new book "A Parent's Guide to Autism: Practical Advice. Biblical Wisdom."